Fragile contexts are increasingly becoming battlegrounds in regional and international geopolitical contests. Full-fledged wars between states remain rare, but the distinction between intrastate and inter-state conflicts is now often badly blurred. 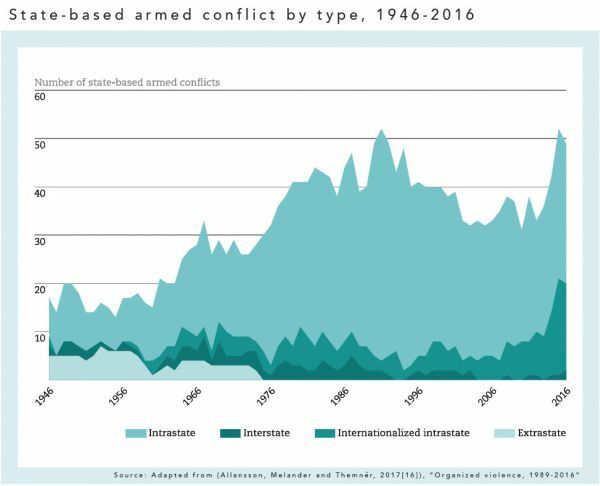 Of the 47 intrastate wars recorded by the Uppsala Conflict Data Program in 2016, 18 (38%) were internationalised “in the sense that external states contributed troops to one or more sides of the conflict”. This figure is exceptionally high by post-Cold War standards. It may also underrepresent the number of internationalised civil wars as it does not include cases in which outside actors support combatants with arms, money or proxy forces rather than only troops. While many studies of conflict-affected states now emphasize their local dimensions and small-scale conflict dynamics, the trend towards the internationalization of civil wars presents new worrisome challenges. As Erin K. Jenne and Milos Popovic have noted, studies show that external interventions make conflicts “far bloodier and more protracted than non-internationalized civil wars.” External actors offer combatants additional resources to sustain conflicts that would otherwise lose steam. They also complicate peace making by expanding the universe of interests and “veto players” involved in diplomacy and can get in the way of neutral mediation efforts. Where global and regional powers support opposing sides in a civil war, a conflict can also poison broader international relations and undercut international institutions. The case of Syria has painfully illustrated all these trends since 2011. As more and more powers have become directly and indirectly involved in the multi-front conflict, the United Nations Security Council has been repeatedly deadlocked over how to deal with the crisis. Not all external interventions in civil wars are bad. The rapid French and African intervention to stop jihadist and rebel forces from overwhelming Mali in 2013 stopped the crisis from spiralling out of control. Nonetheless, protracted international civil wars are liable to create vicious cycles of international competition, serious violence and failed diplomacy. Historical cases such as the U.S. intervention in Vietnam and the Soviet misadventure in Afghanistan show that such cycles can be major drains on an intervener’s resources and political capital. International decision makers need to ask why internationalised civil wars are on the rise and take steps to defuse and prevent such notably ugly conflicts. These steps are not incompatible with policies to address the local origins of conflict. The best way to stop a civil war becoming internationalised is to remove potential domestic sources of violence. Had the Syrian government and opposition reached a settlement in 2011, when violence and outside interference remained relatively limited, the country’s descent into chaos and its pernicious international consequences could have been avoided. Stopping violence once it starts is never simple or straightforward, and a number of factors mean that more rather than fewer civil conflicts will become internationalised, but averting or containing this trend must be a priority. What is driving the internationalization of conflict? Bad neighbourhoods Research on previous generations of internationalised civil wars emphasised their link to what were called regional conflict formations or bad neighbourhoods. Intra-state conflicts rarely emerge in geographical isolation. Instead, they commonly arise in regions affected by economic weakness, linked ethnic grievances, cross-border criminal networks, and struggles between local and/or external powers for predominance. These regions include the Middle East, the Sahel and central Africa. In such situations, states may inspire or intervene in neighbours’ conflicts to secure resources, expand their influence, or secure themselves from genuine threats to their own security from overspills of violence. The threat of transnational terrorism Since the September 11 2001 attacks, many powers have intervened in foreign conflicts to stem or contain what they regard as transnational terrorist threats, in particular jihadist groups. There has been a de facto revision of the concept of national self-defence to include pre-emptive strikes against existing and emerging terrorist bases. But this is complicated by the fact that many non-state armed groups are deeply involved in local conflicts. Jihadists exploit state fragility and civil wars to expand their influence, building local alliances with less ideological forces, and the boundary between counter-terrorism and actively engaging in a civil war is often unclear or non-existent. Geopolitical power plays In an era in which economic and military strength is becoming more diffuse, great power competition and regional struggles for primacy are becoming increasingly open. These are taking place in multiple spheres, ranging from maritime competition to cyberspace. Nonetheless, competition for influence over fragile contexts – sometimes driven by practical considerations like contests over resources and at other by less tangible factors such as prestige – are liable to be a recurrent feature of this wider contest for international influence, further complicating peace-making attempts. In worst case scenarios, as in the Middle East, all these factors combine to fuel extremely violent clusters of civil wars. External actors such as the United Nations then find it difficult or impossible to apply some of the tools for managing civil wars, such as mediation and peacekeeping, to ending a conflict. Additional factors, such as tensions over large movements of refugees and migrants and fears of nuclear proliferation, may also push powers to intervene in other people’s wars even more in future. Regional/international approaches to conflict prevention Where there is a significant risk of the internationalisation of a civil war, outside actors who want peace must factor this into their preventive actions. Where conflict looms, the International Crisis Group has argued, there is a need for multinational “framework diplomacy” and “policymakers should make early and concerted efforts to bring international players to the table to assess their interests, hear their analyses and develop common positions on how to act.” Even if it is impossible to bridge these divisions and external actors support opposed sides in a civil war, policy makers should keep up contacts over limiting and containing the violence. At some point, it may be possible to forge an international or regional agreement on ending a conflict to guide domestic peace efforts, although cases such as Syria show how hard this is. Creating incentives for non-intervention It may be possible to back complex framework diplomacy with coercive or positive steps to incentivise external actors to limit their role in a civil war. These can include ensuring that resources illegally extracted from a country in civil war by intervening powers cannot be sold on global markets; targeted sanctions and military deterrence against interveners; and offering structured incentives such as regional aid and trade packages or security guarantees to actors in regional conflict formations to convince them co-operation trumps conflict. Experience shows that coercive mechanisms such as sanctions may backfire, although the more positive incentive offers are unlikely to have full effect unless balanced with some realistic penalties. In an era of mounting geopolitical tensions, such gradual steps may seem unequal to the risks of further major violence. But efforts to manage internationalised civil wars have the potential to save lives, help states avoid collapse and reduce frictions amongst global and regional powers. A prevention agenda focusing on these priorities would help secure not just states experiencing fragility, but the entire world. To read the OECD’s report, please visit: States of Fragility 2018.